The future of jobs: How will education change as a result? The implications of automation on both current and future workforces are a widely discussed topic across industries. But while it's true that the growths in AR, AI and robotics are a risk to some jobs, such advancements could actually create new opportunities which haven't yet been considered. Humanity has always adapted to technology. Indeed, a recent World Economic Forum survey found that 65% of children entering primary school this year will grow up to find work in totally new industries. With that in mind, the advent of automation should be viewed as an opportunity rather than a threat. It's as important that our future generations are just as adaptable. By investing in education, you can give your child the tools to choose a career that not only suits them, but the economic climate ahead too. To use robotics as an example, there's increased demand to introduce programming and coding to syllabuses in order to meet this new sector's demand. To safeguard an employment market in flux, developed nations are relying on education more than ever – both to remain competitive, and to spur on the next generation of innovators. Yet rising costs in education are also something to consider. While an undergraduate degree in London can cost approximately £150,000 today, in 10 years, this is likely to grow to £268,000. In 15 years, it could be as high as £378,000. These rising costs show that it's important to start saving for your child's education as early as possible. Whether it's through small regular investments, or a single lump sum, there are a number of ways you can achieve your investment goal – many of which will depend on your risk appetite. 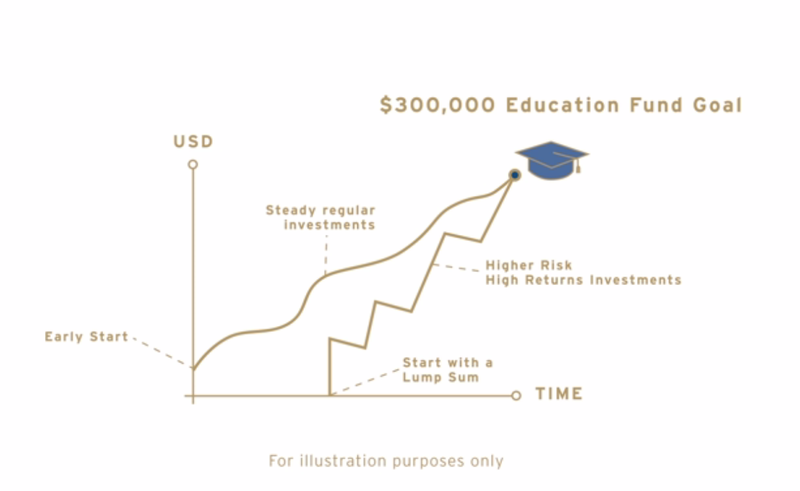 To help ensure your investment progress is always within your reach, you can use Citigold's Total Wealth Advisor to set up goals and track your education fund. Of course, your Citigold Relationship Manager is always on hand to personally advise on any investment – whether it's for your child's education or otherwise.